Hero No.7 are back! Their debut release, the ‘There Ain’t No Party Like A Hero Party’ EP, achieved cult status after receiving support from the likes of John Peel and Steve Lamaq. It included the cheeky mash-up, ‘Bring The Files’, and also ‘Cut Up Party Tune 101’, which was picked up by V2 Japan for Mansfield’s ‘Spinout 3’ mix CD. Not content to rest on their laurels, they followed this up with a 45 on Sheffield’s 7 Hills Records, featuring the hip-hop funk of ‘Keeping It Real?’ backed with the mellow groover ‘Besomebody’, which received support from Coldcut, Ollie Teeba (The Herbaliser), Mr Scruff, John Stapleton, Andy Smith, and many others. In fact, Ollie Teeba liked ‘Keeping It Real?’ so much, he’s put it on the new Herbaliser mix that is coming out in the FabricLive Mix CD series! 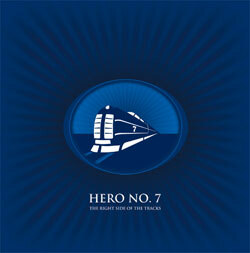 Now, Hero No.7 return with a new EP, ‘The Right Side Of The Tracks’, the first for new imprint Hero Records. The long anticipated ‘Roots of a Hero’ tells the story of beat digging through the art of cut’n’paste, and has already been hailed as a ‘future rocker’ and ‘superb’ in Grand Slam Magazine’s definitive guide to the genre. ‘Black Mountain’ combines live flute and sumptuous strings over bossa beats for a simple, but infectious, tune that’s guaranteed to bring a few rays of sunshine into those dull winter days. Edinburgh-based multi-instrumentalist Dave Bernard was recruited to add his skills on guitar and keyboards to Hero No.7’s heavy drums on ‘The Seventh Sense’, for a cop-funk workout sure to devastate the dancefloor. The EP draws to a close with the cinematic hip-hop beats of ‘Futuristics’, showcasing the more brooding, moody side of the group. Keep your eye out for plenty more from the Hero camp over the next year. Watch out, they mean business. Listen to it here and read the reviews below and please check out the link to the shop if you would like to purchase it on vinyl or mp3. Hip-hop, funk and spoken-word samples finish off this new Hero No 7 12″ nicely. Having aleady gained notoriety with the There Ain’t No Party Like A Hero Party single, The Right Side Of The Tracks is the first EP to be released through their own imprint, Hero Records. EP highlight has to be future-funk classic The Seventh Sense; with a mesmerising combination of deep funk basslines, Dave Bernard’s wah guitars, horns and heavy breaks that would have any serious beat collector drooling. Elsewhere, the group delve into the broody hip-hop of Futuristics with devastating effect. Taking a cut ‘n’ paste aesthetic, the EP centre point is the sprawling Roots Of A Hero, with a fierce blend of low slung bass, cut-up vocals and lightning scratching. The chilled hip-hop of Black Mountain meanwhile, is the calmer side of the group, throwing live flutes, acoustic guitars and hazy hip-hop beats into the mix. Hero No 7 are back with a vengeance and proving once again, they are in a league of their own. The Right Side Of The Tracks will appeal to fans of Grand Central, RJD2 and Mr Scruff. Highly recommended. They’re hardly strangers to the world of DJ pleasing beats – Hero No. 7 releases have been played by the likes of Mr Scruff, Coldcut, Andy Smith, Ollie Teeba, Steve Lamacq, to name a few – and have also featured on numerous compilations and mix CDs. But now they’ve now found a new home, and prepare to take on 2006 – Hero style – with their latest release. Seven tracks (naturally) of perfectly blended turntablism and b-boy attitude, they know how to work a clever vocal sample (“Roots Of A Hero”), or how to let the funk flow, such as the number-crunching & gloriously sleazy “The Seventh Sense”, highlighting some excellent keyboard & bass work. “Futuristics” also shows their moodier side, turning off the overhead lights as the the biggest, broodiest psycho killer with a mean set of drums stands right outside your door banging them. Seriously attuned and done with utter panache, Hero No. 7 should be on your decks right now. Essential.